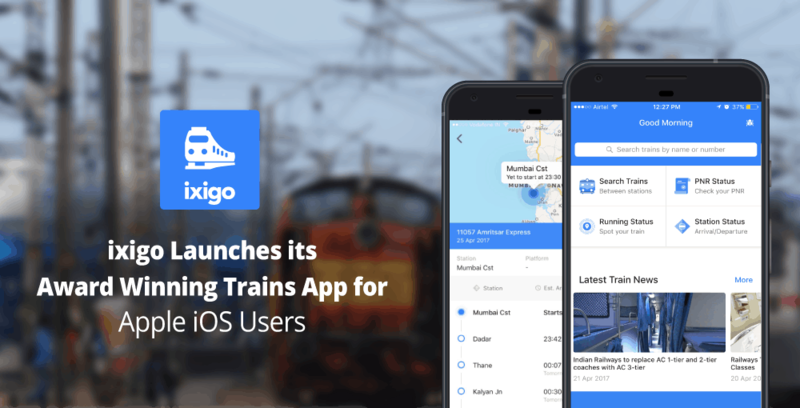 India’s most popular train information app, ixigo trains will now be available for download on the app store for Apple phone users. With the Android version of the app having been named “Best App of 2016” by Google Play Store under the “Made In India” category, ixigo is all set to introduce the enhanced version on the app for iOS users. The ixigo trains app is packed with many handy features that ensure a hassle free train information search and travel experience for Indian passengers. ixigo predicts the probability of ticket PNR confirmation for waitlisted tickets and tracks the status of all booked tickets and trains. The app also shows the live running status of trains insuring one knows exactly where their train has reached in real-time. Some other unique features include the ability to search trains by name or number, checking seat availability, fares, routes & amenities, accurate seat map display and much more. The app is not only useful prior to the journey, but also during the trip. On the train one can use the ixigo trains app to catch up on news stories related to trains, save offline routes and even play games to pass the time. Travellers can also share information such as their PNR details, running status, availability and more with their friends and family, via the app with ease.